In my experience, this Fundamental is truly a foundational element for every successful organization. As you no doubt know, in most organizations (and in our society at large), people often spend more time determining who was a fault than they do actually fixing the problem. At the first sign of an issue, we want to know whom we can sue or we convene a panel to determine where the blame should fall. Not only does this delay or prevent us from fixing issues, but as importantly, it creates an environment in which people are unwilling to take chances or even to surface issues. Why take a chance when you’re just going to be blamed if it doesn’t work out? And why own up to a mistake if you’re destined to pay a big price. Figure out how to fix the problem. Go back and do an “autopsy” to see what happened and what we can learn. Improve our processes based on our learning, so we reduce the chance of making the same mistake again. Notice how blame is conspicuously missing in the steps above. For most of us, our natural response to being blamed is that we become defensive. We make up excuses or explain the reasons why it really wasn’t our fault. The emotions that usually come with feeling attacked create “noise” in our listening channel, and make it hard for us to even notice or hear the lessons that may be inherent in the situation, not to mention the fact that we haven’t solved anything. 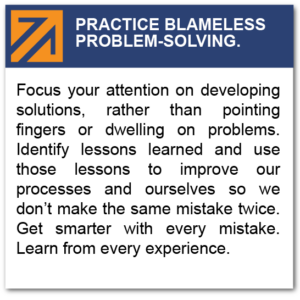 It’s important to note that practicing blameless problem-solving does not mean that there’s no accountability and that it’s OK to keep screwing up again and again. We all need to be accountable for our performance. The key, however, is to focus on the process rather than the person. Notice the difference between asking “How did this happen?” or “Where did our process break down?” versus “Who messed this up?” When we focus on the process and where it broke down, we have the opportunity to learn and to improve the process or plug the hole so that we don’t have this happen again. However, when we simply focus on whose fault it was, we do little more than affix blame. The key is to keep learning and keep getting smarter with every mistake. Simply affixing blame ultimately serves no useful purpose. What might it look like if there was less blame in your organization and more learning? How would it affect innovation? More importantly, how might it impact your results? The Fundamentals™ Process is a proven system to help your staff more consistently practice the behaviors that lead to success. If you’d like to learn more, just give us a call or send us an e-mail.